You’ll enjoy flower and other delights with Cannaclusive, and like-minded cannabis and cinema enthusiasts. We invite you to an elevated film screening in Hollywood. We’ll have snacks, gifts to enhance your 4/20 and more to share with you. Meet industry affiliates and expand your network over food, drinks, and film! We’ll take in a film and more on an exclusive rooftop with a glamorous Hollywood view! This is an all inclusive consumption experience. Lots of goodies and surprises for attendees. Cannaclusive celebrates the cultures of the thriving cannabis community through curated experiences, groundbreaking insights, thoughtful content and dynamic visuals in the fight for cannabis legalization and destigmatization. 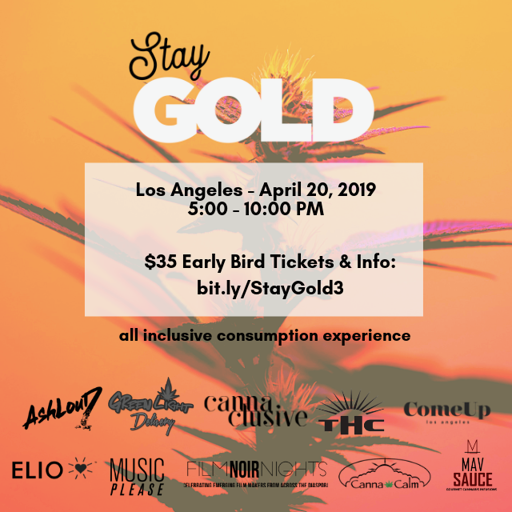 Cannaclusive, Los Angeles, SPACES Rooftop, Stay Gold L.A.